Can Cau is a busy market which is held every Saturday. Located just below the Chinese border, it is a colourful, vibrant market where you will encounter minority peoples such as the Flower H’mong (Red H’mong), Nung, Phu La and even Chinese people from across the border. All kinds of goods are traded here, from fabrics to various types of livestock to the powerful local corn wine. 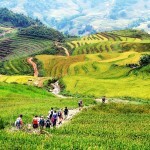 – Drive to Can Cau (125 km / 3 hours from Sapa, or 87 km / 2 hours from Lao Cai). – Take time to explore the market. Mingle with the locals and soak in the atmosphere, maybe try to haggle a bargain! – After the market travel to Bac Ha town to have lunch in a local restaurant where you can try the traditional lunch of Thang Co (horse stew) and corn wine (alternative dishes are available!). – After lunch we will drive to Ban Pho village and take a short walk around where the Flower Hmong, Tay and Nung minorities live. 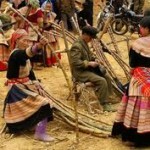 – We will see the local people making corn wine in their houses, ready for the Bac Ha market on Sunday. – End the afternoon with a visit the house of Mr. Ho. A local H’mong man who performs traditional music, dance and story telling. – Drive back to Sapa or Lao Cai.